History: Trans-Air was formed on September 24 1946 to conduct world-wide pax and cargo charters from its base at Brussels Melsbroek. Intension was to use three HP Halifax, but wasn't found suitable for their kind of operations. One airframe arrived in Belgium on November 21 1946, but a couple of weeks later it was returned to the U.K.. 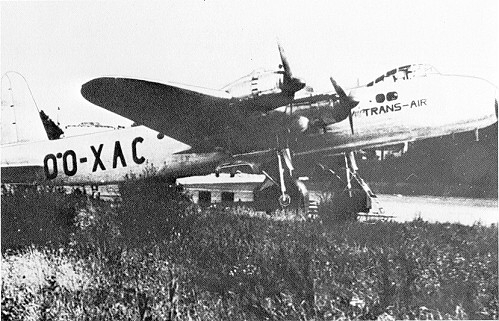 In 1947 ten war surplus Short Stirlings were bought, and after conversion to civil use, to be used to start the proposed pax and cargo services. First revenue flight was made on June 13 1947 between Manston-Bergamo. The company was sold to Air Transport on October 21 1947 with the remaining three Stirling coming in their hands. On its turn this company ceased operations during 1950.